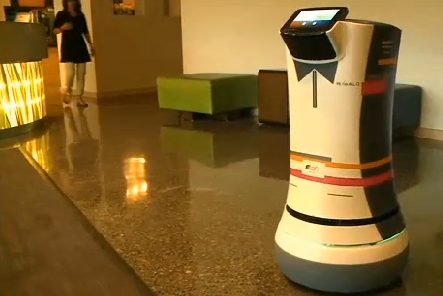 A hotel in California's Silicon Valley is trying to appeal to the most tech-savvy of customers, utilizing robots -- in lieu of humans -- to deliver towels and other necessities to its guests. The Aloft Hotel in Cupertino, Calif. has announced that it will be training two robotic "Botlrs," named ALO, made by Savioke. Their design was inspired by Star Wars' R2D2. "It's something that's very Silicon Valley. It's very novel and I think it's the future," Steve Cousins, CEO and co-founder of the company, told CBS San Francisco. When a guest calls the front desk asking for something -- let's say a bottle of water and a toothbrush -- employees load up the basket up top, the room number is programmed and ALO is on its way. Once it arrives, the guest can enter a rating on its touchscreen or tweet a "tip," using the hashtag #MeetBotlr, reports TechCrunch. Using a combination of sonar wave technology, lasers and cameras, the "botlr" avoids obstacles, as well as humans. It can also communicate with the hotel's elevators using WiFi. "Instead of having a runner up there, you would have a robot coming up to the guest room," Izumi Yaskawa, Savioke's Strategic Ambassador, said. Based on the response to this trial program, robotic butlers may be deployed to each of the 100 Aloft Hotels around the world in 2015, Brian McGuinness of Starwood, the chain's parent company, told TechCrunch. The Aloft is just the latest San Francisco area hotel to experiment with cutting-edge technology. In March, the local Personality Hotels announced a program that allows guests to use their smartphones to unlock their hotel room doors.